What Are the Star Wars Vintage Figures? How Many Star Wars Vintage Figures Are There? The original Kenner Star Wars figures are often referred to as the Star Wars Vintage figures and were released between 1977 and 1985. But did you know that in 1977 the Star Wars license was offered to Mego, who were at the time probably the best known company for producing action figures and were commonly referred to as “The World’s Greatest Action Figure Company”. However, at the time and along with many others, they felt that this would fail at the box office. It is the Star Wars Vintage figures that have become the most collectible, with some of the rarer figures selling for thousands of dollars, in fact as I write this (18/03/2015) a Star Wars Boba Fett has just sold for $18,000! However many of the later Hasbro figures are next to worthless, although there are exceptions to this of course, particularly when taking into account the growing market for premium figures. This is mainly because back in the seventies people didn't "collect" action figures and certainly no-one would even have considered leaving them in their boxes (well, at least not many people) and that's why they are worth so much now. By contrast, there are thousands of collectors now who buy and horde their Star Wars figures, guarding them jealously like mythical dragons guarding their horde of gold. When Star Wars: A New Hope opened in the latter part of 1977 a phenomenon that would last for more than three decades was unleashed on an un-expecting audience. With little to no pre-marketing and a small PR budget, the movie opened in a few select cinemas only. But despite this Star Wars fever spread like the plague and not only beat but annihilated all previous box office records. As a result many of the toy companies and licensors and merchandisers were caught with the trousers down. 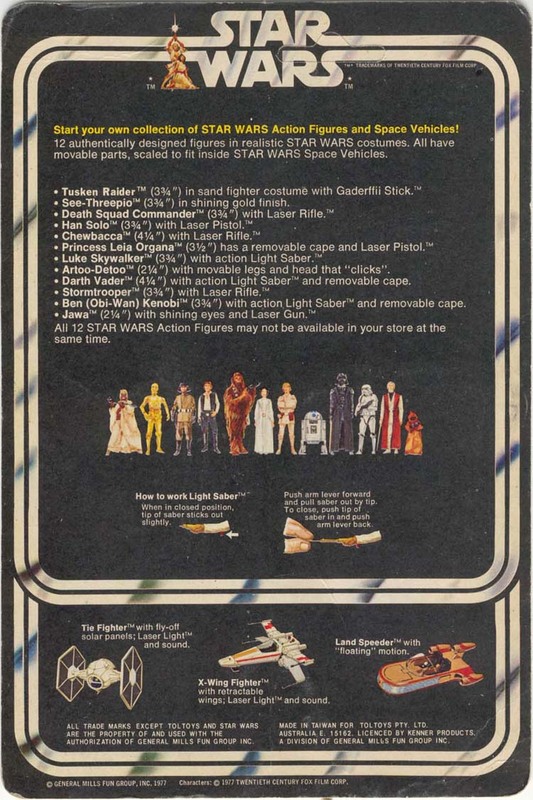 One such company was Kenner who realized that they couldn't get their Star Wars toys into stores in time for Christmas. 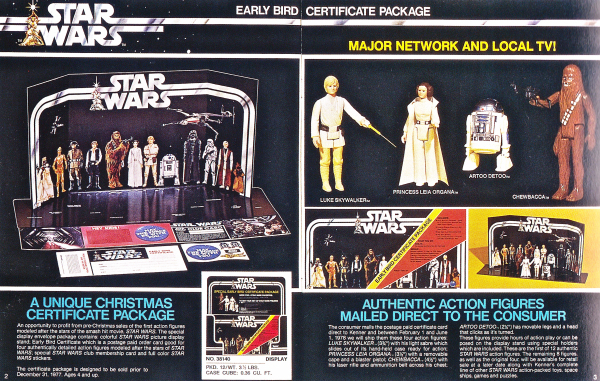 Kenner, unbelievably, managed to pull off probably one of the biggest and most successful marketing campaigns ever whereby they sold special “Earl Bird” packs that consisted of a cardboard display stand for the first four figures and a mail in certificate that guaranteed the holder to a set of the first four figures. 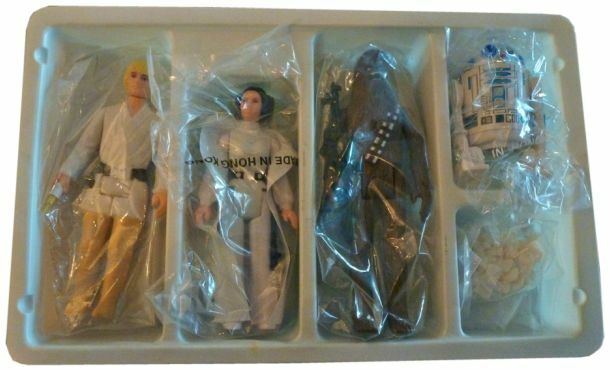 And good to their word, in early 1978 Kenner sent out thousands of mailer boxes containing Luke Skywalker, Princess Leia Organa, Chewbacca, and Artoo-Detoo (R2-D2). This is why the first series of the Kenner Star Wars figures are dated as 1977 when in fact they didn't come out until 1978, however ALL the figures were dated 1977 so they have no significant rarity. 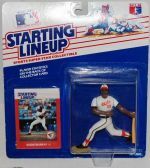 This legacy heralded a new era in action figures and the beginnings of what was to become an increasingly popular hobby. 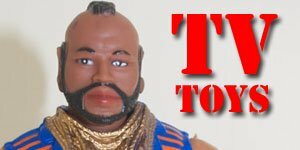 Up until this time "action figures" had consisted of mainly of your G.I. Joes and Action man figures or 8-inch figures such as the Mego figures. But the vintage Kenner figures were the first to use the now standard 3 3/4-inches scale with approx. five points of articulation, i.e. 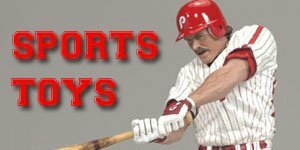 moving parts, and ran from 1978 to 1985. 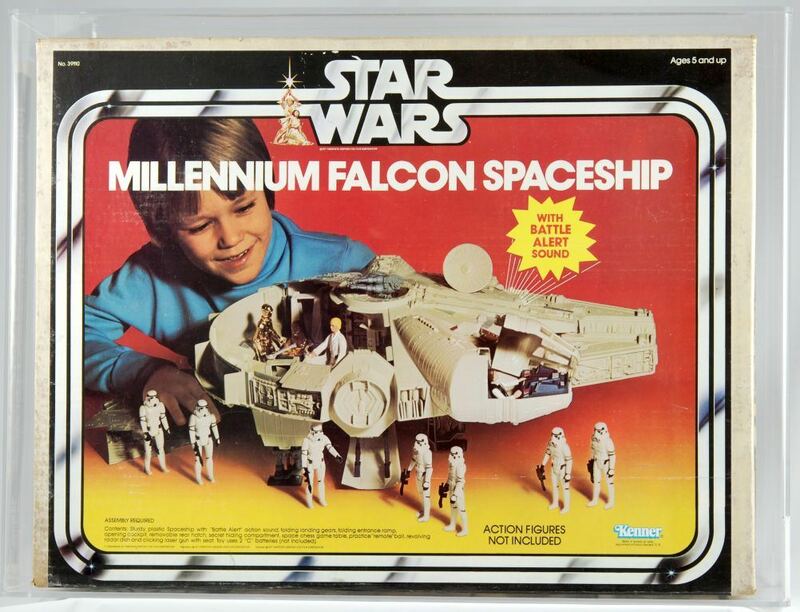 Kenner chose to use this scale to keep cost down so that children could easily afford to buy multiple figures and because it saved costs and made them easier to mass produce. 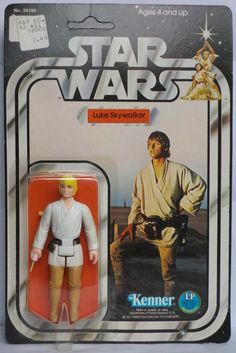 During this period Kenner released 115 figures, excluding production variations, under the titles of Star Wars, The Empire Strikes Back, Return of the Jedi, and The Power of the Force. Later, in 1997, this line was re-introduced to coincide with the theatrical release of the Special Edition movies of the original trilogy. 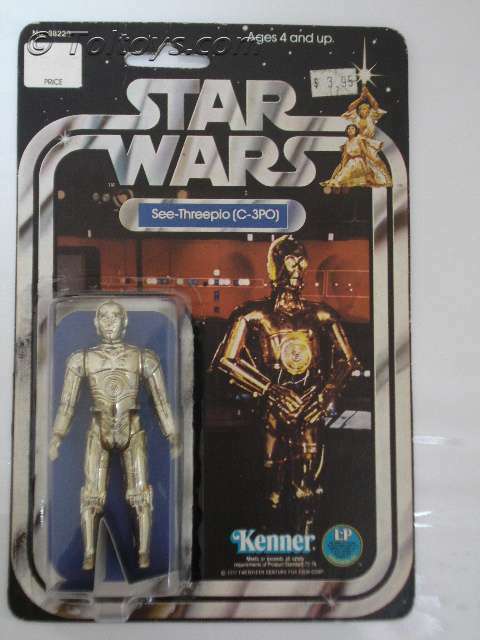 Kenner also supported the comic books and animated television programs in 1985 with figures and play sets under the titles Droids and Ewoks. The figures in these sets, with the exception of the Boba Fett and A-wing Pilot figures, were sculpted exclusively for these releases and each character featured a specific collector’s coin. All in all Kenner enthralled millions of kids who immersed themselves in a world of aliens, rebellion and evil for more than a decade and their legacy continues to this day, even more than three decades after the first Star Wars toy hit store shelves. In terms of variants it’s important to remember that most of them sprang up as a result of the restrictions of the manufacturing processes. 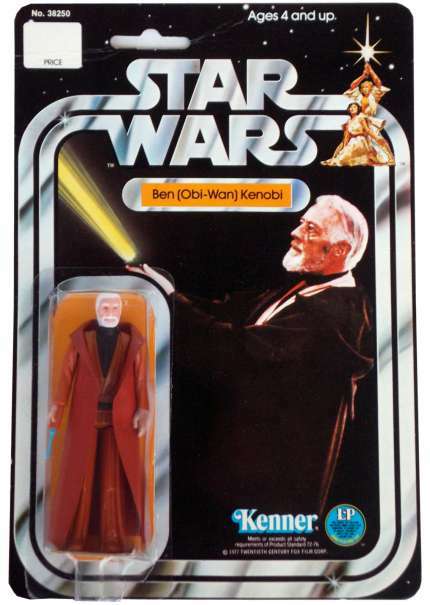 Kenner was being given photographs and very basic information on many of the characters, especially prior to the release of the original Star Wars. Nobody knew how huge this was going to be or how in demand the toys would be, nor how seriously fans and future writers would take the tertiary characters and lore, so mistakes and silly assumed names slipped through. Hence Snaggletooth, Hammerhead, Walrus Man rather than their later personalities of Zutton, Momaw Nodon and Ponda Baba. As well as these figures there were a multitude of classic and beloved vehicles, many of them even more iconic than the characters in the movies, including of course Luke Skywalker’s Land speeder the Millennium Falcon, the TIE Fighter, the X-Wing fighter, the All-Terrain Armoured Transport or AT-AT, the rebel Snowspeeder and the AT-ST Scout Walker. 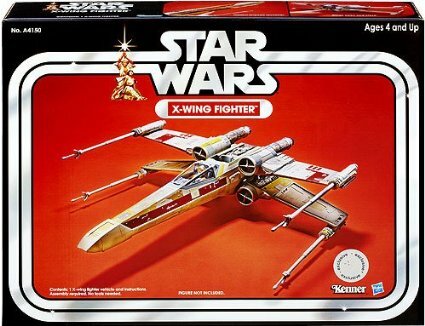 As with the figures, finding these with complete, undamaged packaging is extremely difficult and the last few examples like the Imperial Shuttle, the A-Wing and B-Wing are some of the hardest to find and command very high prices for mint condition. These can make for excellent diorama displays to make your carded and loose figures feel very much surrounded by a window of their time. There were of course twelve inch figures, roleplaying toys, miniature playsets and too many other merchandising examples to list on this report and that was before the second explosion in popularity that began again with Hasbro in the late 90s and has not stopped. 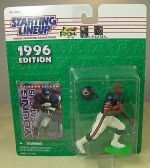 If you are looking for carded figures then this could become an expensive hobby. 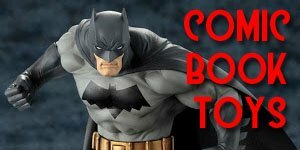 It will be rare that you will find bulk lots of multiple carded figures at anything approaching a bargain price, simply because everyone canny enough to obtain them isn’t going to let them go for a song and will sell them for their market rate. The act of paying a well-meaning silver-haired old lady a nominal fee for her grandson’s treasures is now in the realms of mythology. Everyone knows these are worth something. Each figure consists of a pretty sturdy shiny card and a bubble or blister in a variety of shapes and sizes depending on the figure inside. Long, thin rectangles for tall characters like Chewbacca and Darth Vader, short squares for the Jawa and ewoks. The accessory will be attached within the bubble via sticky tape. And there will frequently be a small card inserted for their feet to rest upon. These bubbles, like most of their kind were and remain extremely susceptible to yellowing. This can be caused by prolonged, direct exposure to sunlight or the ultraviolet rays from fluorescent lighting and can happen over only a few months if not kept in check. If you want to keep a particularly valuable figure absolutely safe you will need a UV protective case or simply to keep it in darkened storage long term. There is a steady business of reproduction carding, some of it extremely professional. The seller will almost always state this as the case but if you aren’t sure then check their feedback for possible fraudulent re-carded sales. 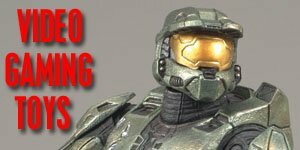 Repro and recarded figures are often wonderful to display at considerably less cost than original carded figures so it may actually be a way to go to make the most of the figures you have. One sensible idea would be to look at the 98 figures and four series detailed above and rather than pledging to collect every single one of them, start with a small, specialised section of the full range. Perhaps only the Empire figures or only the ones you had when you were a kid or maybe all the ones you didn’t have. Either way, once you complete a smaller collection you can move outwards from there and expand. If you are going to collect loose examples you will need to pay close attention to certain conditions and be very aware of regular issues within this line. Tightness: This is the first thing you should check for in the listing or description. 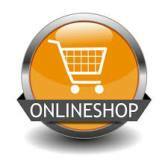 If there is no mention of it then check with the seller on a one to one basis. Don’t just assume they will be sufficient. Over years of play the legs, arms and heads can become incredibly wobbly. They were cheaply constructed as children’s toys not hardwearing tools so now, decades later, a high percentage of them are very loose. If they have wobbly arms they will not pose. If they have wobbly legs they will not stand so you may as well throw them in a bucket for display, or possibly have them forever seated in a vehicle. Fading and Yellowing: These were figures that spent a lot of time in the sunshine. Often you will get one part of their body that yellows faster than the rest, due to the different density of the plastic or the thickness of the paint. Unlike tightness though, this should be apparent in the photos unless they are of very poor quality in bad lighting. Smell: It seems silly, but these figures often absorb odours. 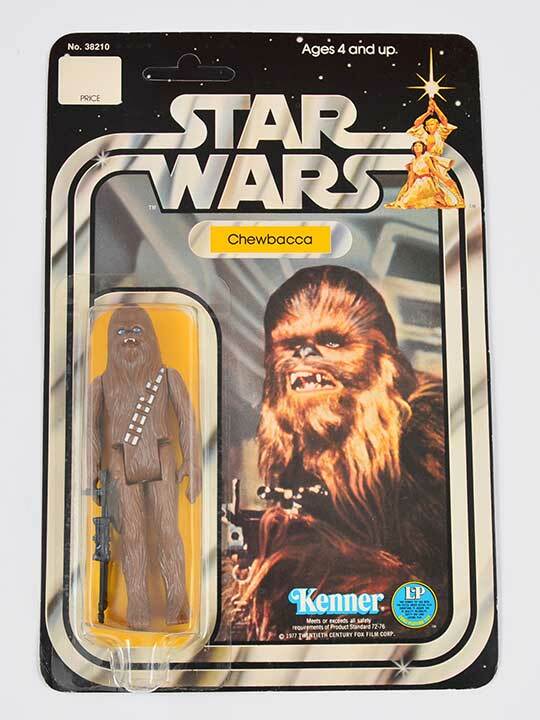 I recently picked up a Chewbacca that smells like I remember him smelling in 1987. This one is less easy to pin down in a listing, but look for “From a pet and smoke free home” to ensure they won’t reek when you get them. If that disclaimer is on the listing you can usually be sure they don’t smell strongly of anything else in particular. Like most countries around the world, the Kenner line of toys had a large influence on children in Canada. Kenner Canada, located in Toronto, Ontario, held the license for Star Wars toys in Canada from 1977 until 1985. Kenner Canada was actually a joint venture between Irwin Toy of Canada and General Mills/Kenner USA. Irwin Toy's mandate was to be the exclusive distributor of foreign toys in Canada. As a result, the Canadian market saw many foreign toys released in Canadian packaging under the Kenner Canada name in addition to the regular line that was released in the US. The Canadian Star Wars line ended abruptly in 1985 when the joint venture was terminated. 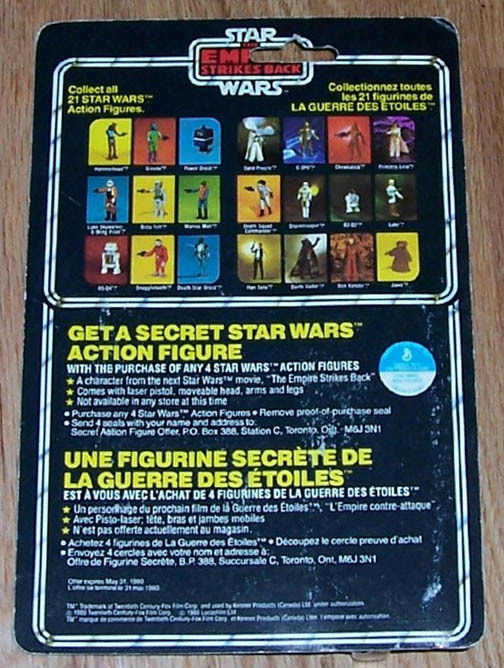 As a result, Canada never saw the entire Power of the Force line in Canadian packaging, as well as several Return of the Jedi, Droids, and Ewoks items. Canadian Star Wars items were only produced at about 10% of American volume levels. 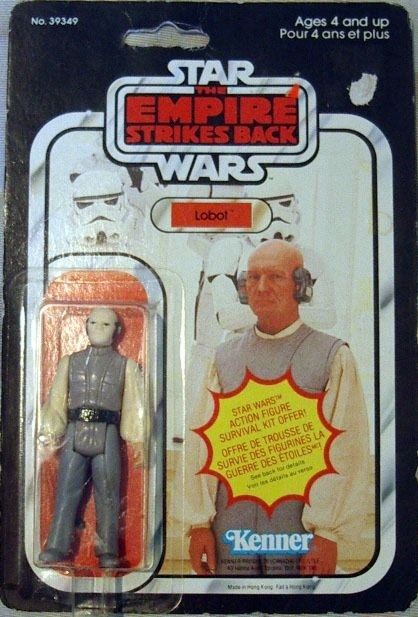 As a result, very few Canadian versions of vintage Star Wars items exist today. Canadian releases of Star Wars toys are unique in that their packaging is bilingual; consisting of English and French text in order to comply with bilingualism laws. 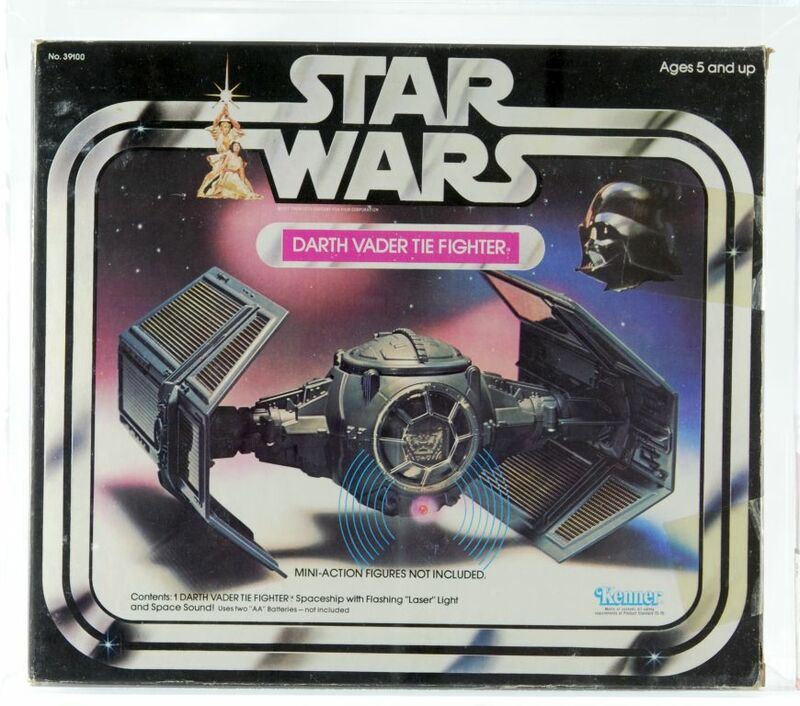 This resulted in some very visually striking packaging designs over the course of the original run of Star Wars toys, especially with that of the Star Wars-era toys. It should be strongly noted that Canadian toys have only English and French writing on them; no other languages were ever printed on domestic Canadian-made Star Wars items. Many collectors confuse the multilingual European Star Wars items with Canadian items, especially the Meccano (France) releases. 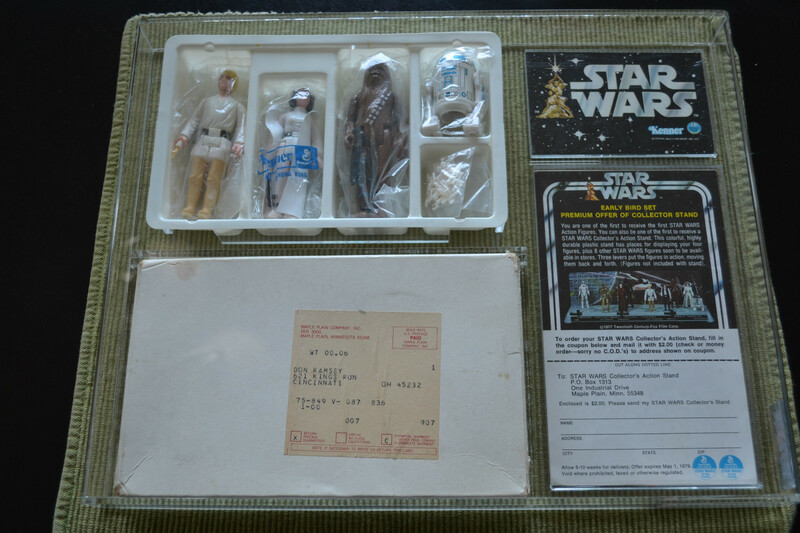 Canadian-made Star Wars items bear the Kenner logo with accompanying Kenner Canada address. 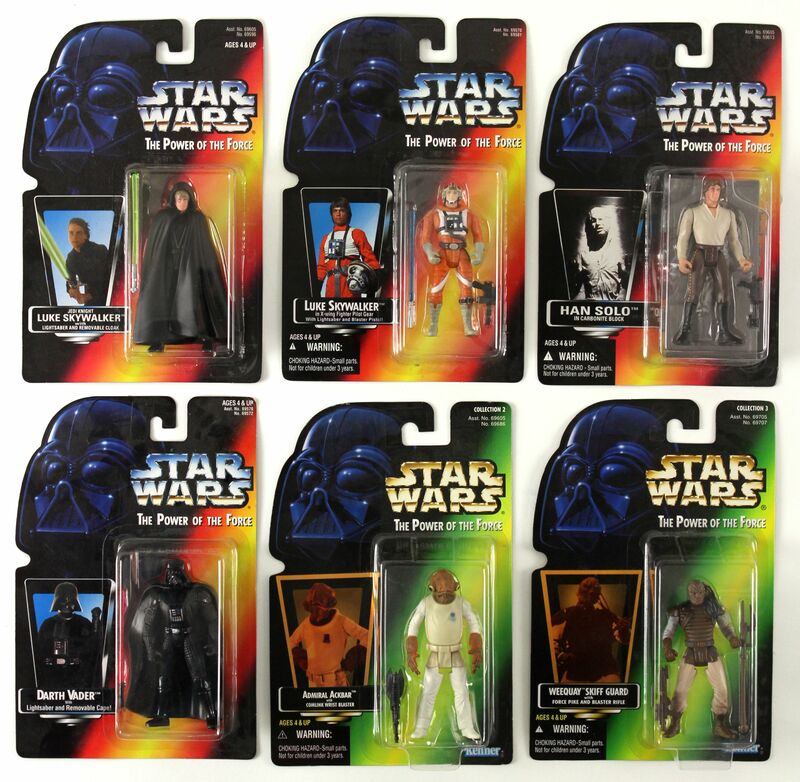 In addition, Canada also received many other non-Kenner toy items that were exclusive to the Great White North, such as several plush toys made by Regal Toy Inc.
Tri-Logo is a range of European-released Return of the Jedi-era figures. They tend to fetch slightly less than the rest on the secondary market. By and large the older the figure the more it goes for although the ones at the very end in the Power of the Force, Droids and Ewoks lines were produced in far smaller numbers than the rest and are thus prized by collectors.